Just look at this idiot. 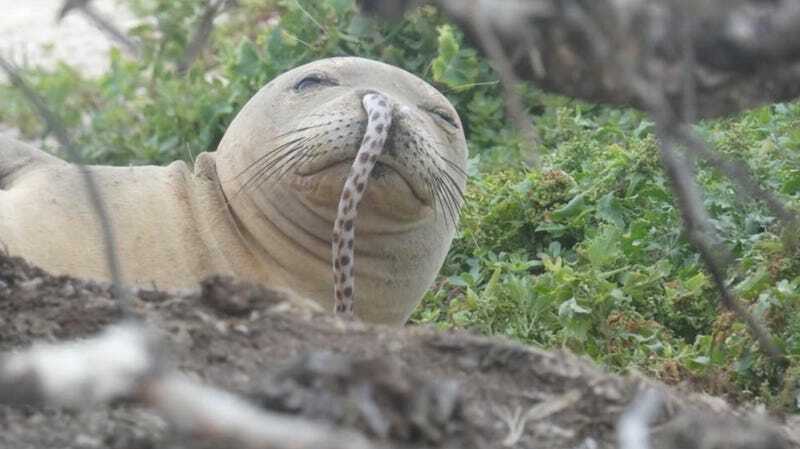 In what is truly a bizarre phenomenon reportedly stumping researchers, a handful of dumbass Hawaiian monk seals have recently been observed with eels stuck up their noses—possibly from shoving their faces into crevices, but researchers tasked with observing these fools can’t say for sure. An image of one such dummy was surfaced Monday on the Facebook page for the Hawaiian Monk Seal Research Program, which monitors the endangered population of these seals. The post said that it had removed eels from the noses of several seals they’re monitoring and that the seals were unharmed in every case, but the same couldn’t be said for the eels. In a post to the National Oceanic and Atmospheric Administration Fisheries website on Wednesday, the agency said that it had observed such an incident “three or four times now” but that it is a relatively new occurrence. [I]n the nearly 40 years that we have been working to monitor and protect endangered Hawaiian monk seals, we have only started seeing ‘eels in noses’ in the last few years. We don’t know if this is just some strange statistical anomaly or something we will see more of in the future. Hawaiian monk seals forage by shoving their mouth and nose into the crevasses of coral reefs, under rocks, or into the sand. They are looking for prey that likes to hide, like eels. This may be a case of an eel that was cornered trying to defend itself or escape. Alternatively, the seal could have swallowed the eel and regurgitated it so that the eel came out the wrong way. We might not ever know. The program reported another eel-in-nose incident on Facebook in 2016. Over the course of several posts, researchers with the program wrote they noticed a male seal with an eel stuck in its face and making a “wheezing sound with every breath.” And reader—for the love of god—if you are eating, please stop reading now. According to the final post in this saga, researchers were able to trap the seal and extract a two-foot-long goddamn eel from its nose, noting that it “was surprising as only about 4 inches were hanging out” of its nose before extraction. Never forget that nature is metal as hell.